Happy New Years everyone! We are happy to have another year of crafty goodness rolling in and we are excited about what the New Year brings. This month, in particular, we are featuring Passion Red as our color of the month to set the tone for the New Year and prepare for one of the hottest cardmaking holidays — Valentine’s Day. Another big deal for the month of January is our participation in Creativation in Phoenix, Arizona. We will be announcing a couple of new product releases and encourage you all to stay tuned! Join us January 17-21, 2019 at the Phoenix Convention Center in Phoenix, Arizona. Education begins on January 17. The Trade Show opens on January 19. Creativation is THE crafting industry conference of the year for small business owners, instructors, buyers or professional crafters. This is the place to be if you are looking to define yourself as a crafting professional, business owner or improve your knowledge of the industry. Several arts and crafts companies, with who we collaborate or whose products we love such as Spellbinders, Waffle Flower Stamps, Rinea Foil, Fiskars, Glue Dots etc, present their new releases, teach workshops and give you specific one-on-one time with company representatives. If you are attending then please come our booth #1113 and chat with us about all of our current inks and mixed media products in our catalog and see what new products we have available in 2019. From AFCI Creativation website– Why Attend? ​If you have a business – ​large or small – in the creative industry, then you don’t want to miss this event! Join thousands of professionals for the ultimate creative industries event in January 2019. AFCI is the heart of creativity and ​Creativation is the place to learn, connect and discover. Learn what’s new, what’s trending and how you can drive your business forward to success through seminars and workshops at Creativation University. Connect with new buyers, suppliers, designers, makers, bloggers, media and entrepreneurs from around the world as we grow our event. Discover new products, inspiration, ideas and innovations, and more that will change your business. We built a vibrant creative city on the Show floor – the capital of the creative products industry and you will be amazed! Class Description: Discover how simple it is to create mixed media masterpieces with your favorite stamping products from Imagine and Tsukineko! Master the simple techniques needed for building color and texture to create this stunning vintage-inspired canvas. Learn how to color and texturize a variety of different surfaces, including metal and other found objects. This class will debut the latest product offerings from Imagine, so don’t miss your chance to be the first to experience the newest products! To be sure you do not miss a beat! Sign up for the Imagine Newsletter! Win 1 Sculpey Soufflé Multipack, Sculpey Essential Tool Kit and Graduated Cutter Set and 1 set of StazOn and VersaMagic Inks! 3. Tell us in the comments – What would you create with these products? No purchase necessary. This giveaway is not sponsored by or affiliated with Instagram. You must be 18+ and have a US address in order to win. Entry closes Thursday 9/13 at 10 AM CST. Today’s blog post is not a tutorial. We are just happy to share some love for our Artist in Residence Jowilna Nolte who is the featured artist in Scrapbook Affairs. We love the colors and illumination in this tag-making project using VersaFine Clair! See the page clipping below to see how Jowilna makes all sorts of projects with this fabulous ink. Here is a sneak peek at one of the pages in the Scrapbook Affairs. In the image below see how Jowilna uses VersaFine Clair in so many different ways. In this week’s blog hop, we are pairing our ink with Precious Remembrance Shop stamps to make a perfect match! Precious Remembrance is a maker of photopolymer clear stamps that offers a super cute style with a variety of options for cardmaking and scrapbooking. Thanks so much for stopping by! 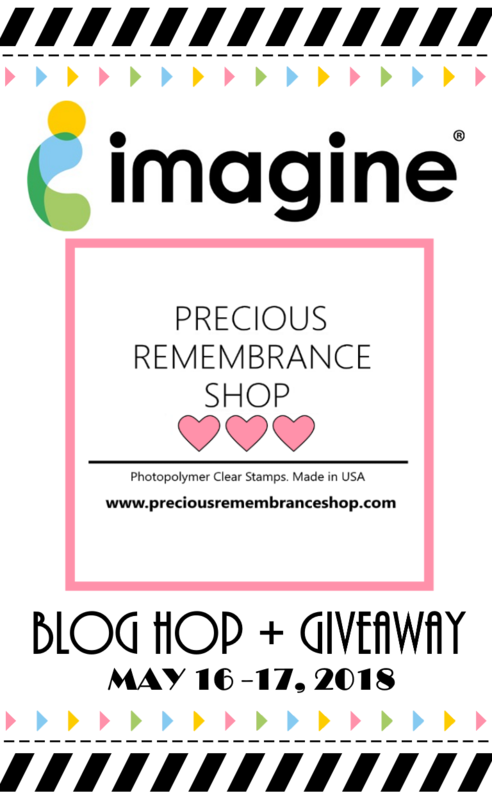 Be sure to leave comments (one per blog, per day) during these 2 days so you can be entered to win a School Days & Totally Stamp Set from Precious Remembrance Shop or a $30 Imagine Gift Card!!! Winners will be announced on the Precious Remembrance and Imagine Blogs at the end of the month. In this week’s blog hop, we are pairing our ink with StencilGirl stencils to make a perfect match! StencilGirl works with a variety of designers to create all sorts of themes and as you know—we have all sorts of inks for all sorts of projects. Thank you for everyone who has participated and enjoy Day 3! Thanks so much for stopping and be sure to leave comments (one per blog) during these 3 days so you can be entered to win a $30 StencilGirl Gift Cards or a $30 Imagine Gift Cards!!! Winners will be announced on the StencilGirl and Imagine Blogs at the end of the month.